Fischers Fritz is one of Berlin’s few two-Michelin star restaurants. 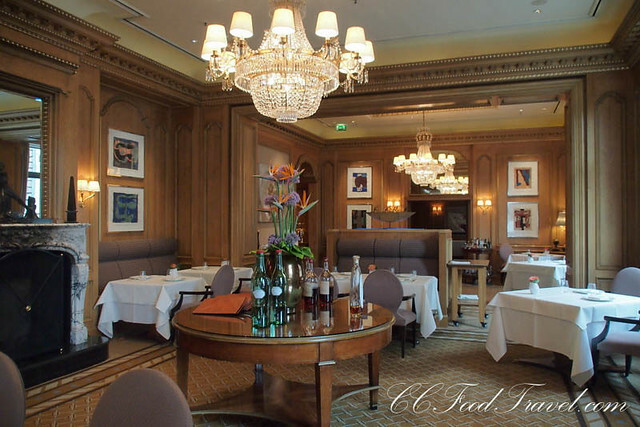 It is located in the Regent hotel, Charlottenstrasse, and it famously serves up Christian Lohse’s French inspired, seafood specialities. Walking into the restaurant, you can’t help but feel a little overwhelmed. 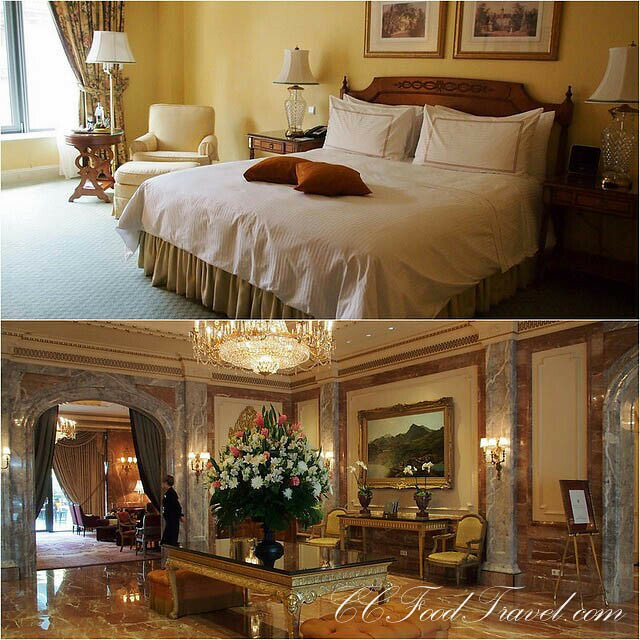 The massive, gleaming chandeliers, warm wood panelling and busts of famous musicians of a bygone era, remind me of an exclusive gentlemen’s club. Since it’s been rather sunny in Berlin, the main dining area is drenched in natural light, on a Sunday afternoon, and the deco can only be described as a classical style with dabs of modern touches. 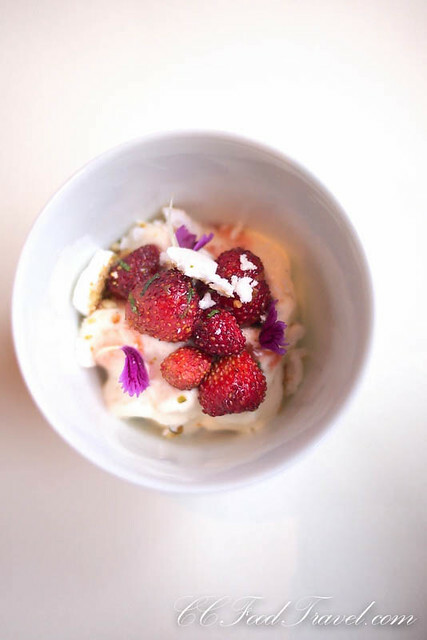 Overlooking one of Berlin’s famous squares (famed for being the most beautiful in fact) the Gendarmenmarkt , you know you’re in for a treat, dining on Chef Christian Lohse’s French-influenced creations. Christian Lohse himself, is one of Germany’s great chefs. 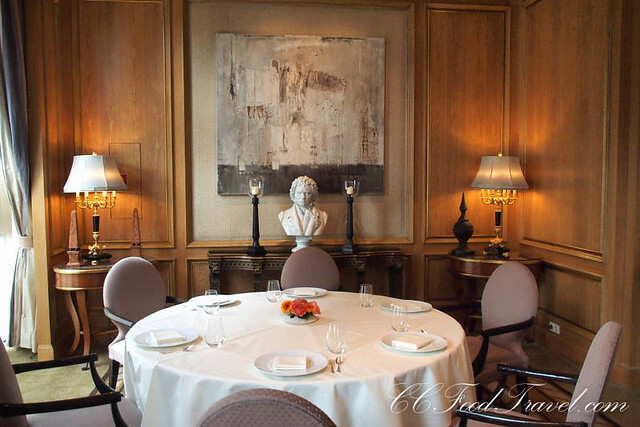 The restaurant holds the accolade of two Michelin stars for the seven consecutive years and so, I rather hoped that the food would deliver in spades. 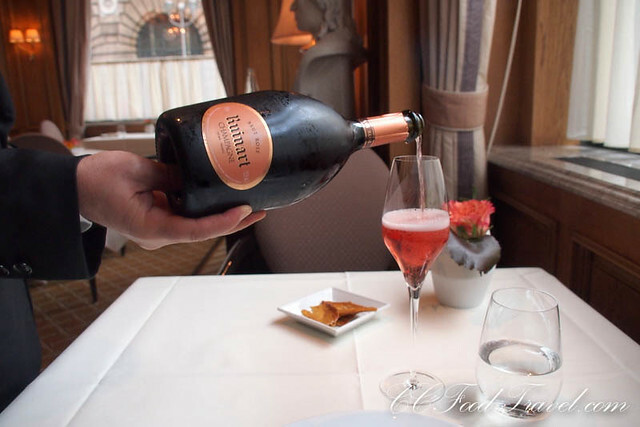 And so, with the sun spilling onto my table, and a gorgeous blue sky for backdrop, we eased into lunch with an equally effervescent tipple, the Ruinart, Brut Rose NV.. a deliciously vivid, acidic Champagne full of rose petal, wheat, cherry and citrus notes. 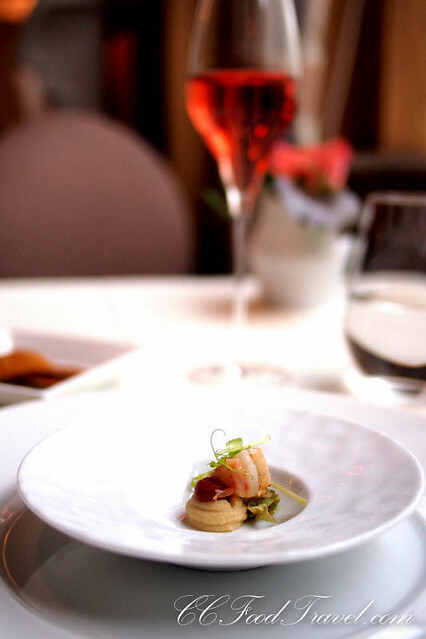 Amuse bouche of Humus cream with artichokes, smoked tomato, salad of beans and a piece of super succulent prawn, went rather well with my glass of pink bubbly. What is it about that color, that automatically puts one into a good mood.. ? 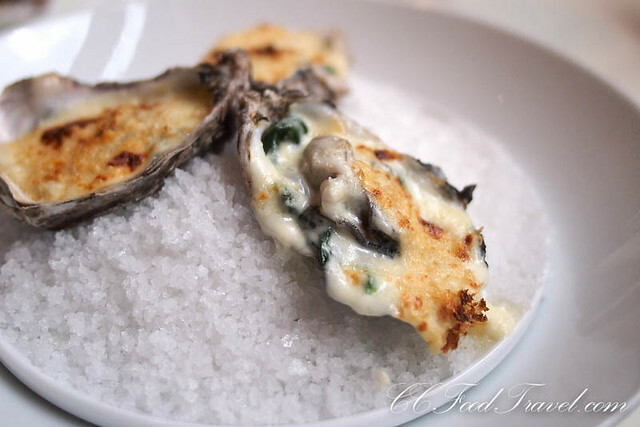 The first starter of Gratinated Oysters Rockefeller with spinach and sauce Mornay, was rich, creamy and decadent. It’s hard to improve on a sweet, fresh oyster on the half shell, that’s lusciously baked with a covering of buttered crumbs or grated cheese until a crust or crisp surface forms. This was a terrific start to the meal. “Onsen” means “hot spring” in Japanese and “tamago” means “egg. This was my favourite course of the day. 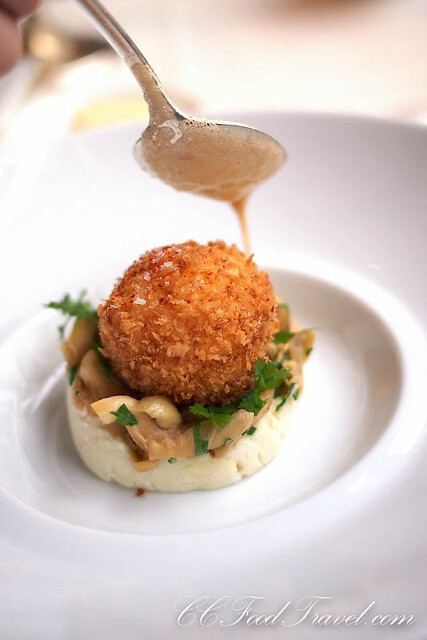 This Crispy baked Onsen egg with golden oyster mushrooms, cauliflower purée with lemon salt and lobster bisque was to die for. The Onsen egg white has the texture of a really delicate custard while the yolk comes out firm, but retains the color and creamy texture of an uncooked yolk. 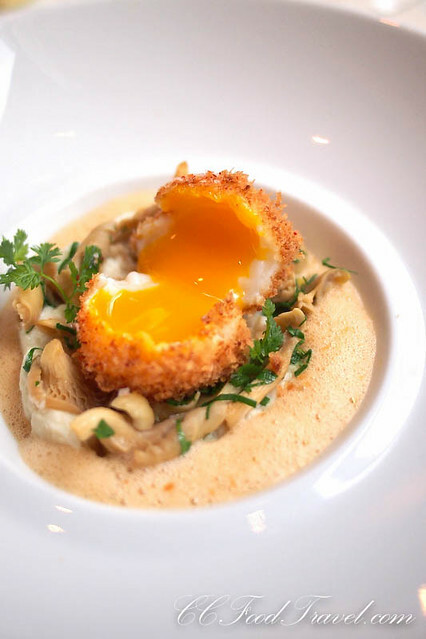 This dish was creative and well executed – loved the way the textured crispy breadcrumbs, gave way to the smooth, hot and creamy egg yolk center. The lobster bisque that was more like a foam than a broth, was light and airy with just enough of a seafood zing to it. This dish is a must order, at Fischers Fritz. 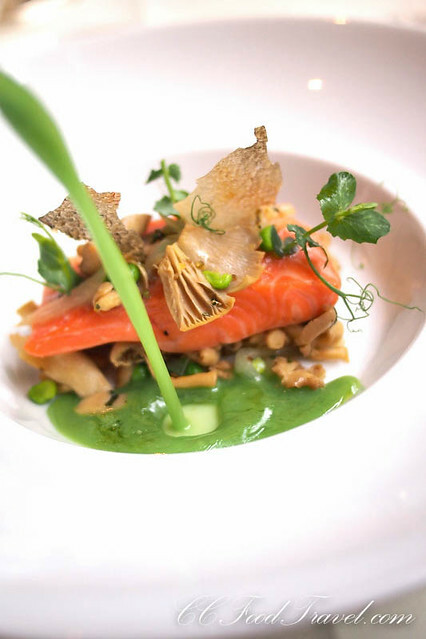 Pink and rich like salmon with a crackly exterior, the Iceland sea-trout is the perfect pair for the meaty golden oyster mushrooms, that packed an irresistibly deep, musky & earthy flavour. 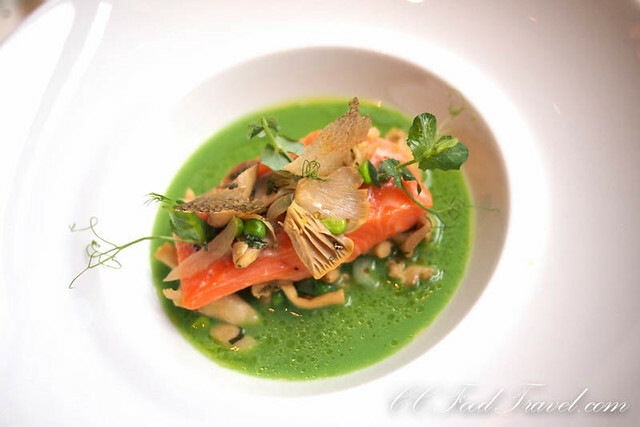 The green pea emulsion was nice but I could have eaten the dish without the sauce. It was perfect as it was. Though the courses looked small, I was pretty full by the time dessert came around. This pre-dessert of Marinated Wild berries from Spain with Vanilla sour cream was rich and a little too creamy for me. After the earlier courses, I would have preferred a sorbet. Now this was an amazing dessert. I would have most happily had this, without the previous pre-dessert course, for sure. 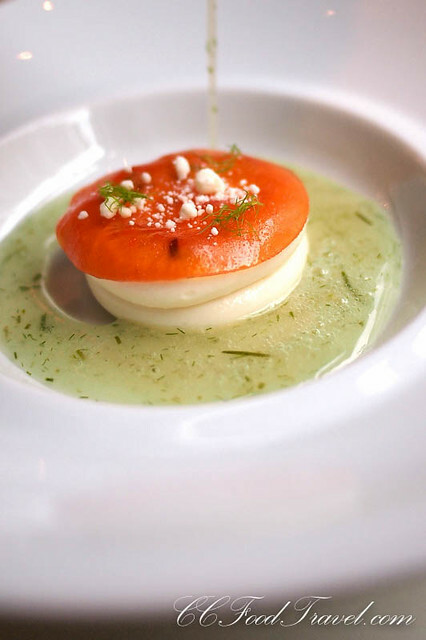 The White Namelaka crème with Campari jelly, & thickened fennel-spruce needle juice, was a beautifully layered dessert. The Namelaka creme was a sweet layer of white chocolate mousse, but it wasn’t too heavy. The next layer of slightly tart & bitter Campari jelly that was soft yet bouncy, and a final dimension, the fennel pine juice delivered a fresh, uplifting forest scent that reminded me of a stroll in the park on a nice sunny day. What a dessert! I love dishes that evoke strong memories, and this one did just that. Totally spot on in terms of presentation, texture and flavour as well. With lunch concluded and the sun still shining, I then had to contemplate one of the harder questions in life.. to continue Languishing at Fischers Fritz, or to explore more of Berlin. I think that at some point, I would have to extract myself form this comfortable chair, but for now, I would enjoy my spot in the sun, for just a little while more. Previous articleCrazy about Loke Yun Ampang’s Chicken Rice! What pretty food and a gorgeous setting. How many appetisers did they serve in a 3 course? Silly question sorry, but some michellin star places tend to strench their courses though it says 3 courses. 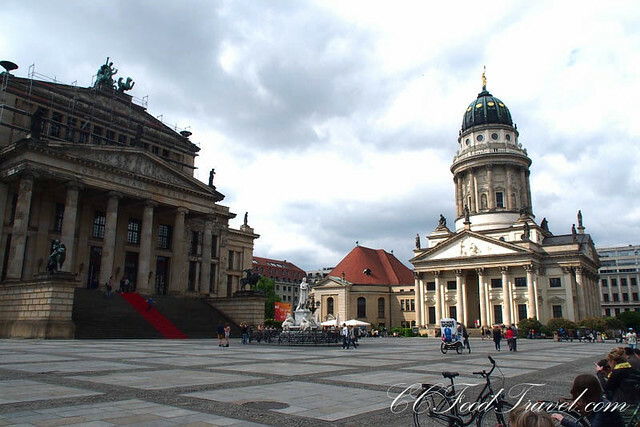 I read its somewhere located in Gendarmenmarkt, one of my favourite square in Germany!